"TMT" came to our district late in the Fall of 2005 straight from his designers "Strut Characters" of Canada . This creation all began as a sketch on paper with the help of a costume designer and artist. 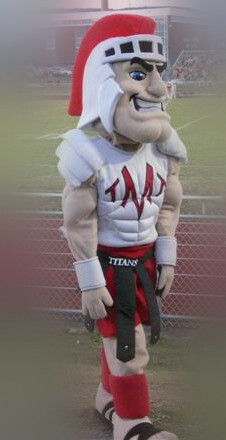 The dream of having a Titan Mascot didn't come easy. The Student Council organized and coordinated efforts to raise the money to purchase "TMT"through local patron donations and fundraisers. Additionally, partial funding came from the Athletic Fund and the District Fund. The purchase of "TMT" comes with an exclusive license agreement and guarantee that it is "one of a kind" and the District can sell items that depict this design.